A tour of Hunza lets you discover a mountainous valley surrounded by massive snowcapped Himalayan peaks. The most famous attraction in Hunza remains Rakaposhi Mountain, overlooking the valley from a height of 7,788 m (25,551ft). A river streams centrally through the valley, with the surrounding scenery shifting colors throughout the seasons and changing from the pleasing warm reds and yellows of autumn, to the full blossom of fruit trees in spring. The villages here don't depend only on tourism, however, as an elaborate stone irrigation system fuels agriculture, ensuring the sustenance fruit, wheat, and an abundance of poplars. Things to do in Hunza include camping, fishing, gliding, hiking through the picturesque valley, and of course, trekking the gigantic peaks. Hunza is in Gilgit-Baltistan. 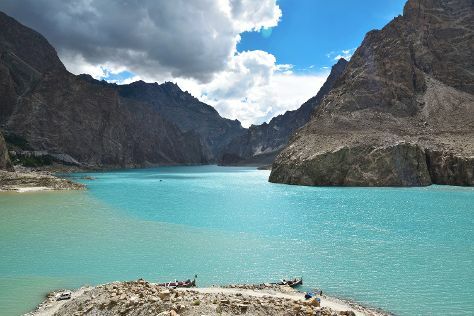 Plan your holiday in Hunza and other destinations, from the rural, to the urban, and everything in between, using our Pakistan online sightseeing planner . A number of small villages provide plenty of accommodations, with the majority surrounding Karimabas, the main bazaar in Hanza. Most casual travelers will find lodgings suitable for all budgets and expectations, but the most demanding of guests may be disappointed. The small sacrifice in luxury is substituted by the breathtaking views of the valley that even some of the least expensive accommodations provide.